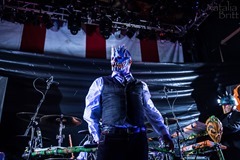 Friday night, the legendary House of Blues saw Mushroomhead, the band that has been feeding us with its avant-garde sound for more than two decades, bringing its visually striking performance to West Hollywood. 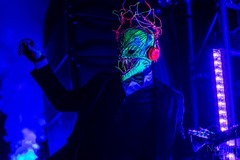 Touring on their new, well received album The Righteous & the Butterfly, Mushroomhead has had an exceptionally busy year. 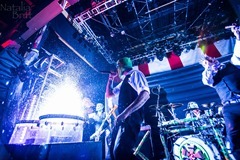 Along with the album release, the band also pleased their fans with two new videos released in April and August. 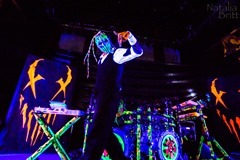 Co-headlining the 2014 Shockfest Tour with Insane Clown Posse, Mushroomhead finally found its way to Los Angeles to satisfy the fans who weren’t able to slog it to the Inland Empire earlier this year when Mushroomhead had a show in San Bernardino. 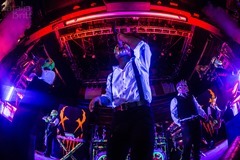 The band delivers the ultimate grotesque and surreal performance that is definitely not for the faint of heart. 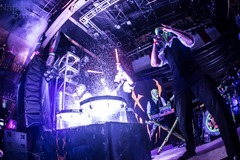 Mushroomhead’s music, a mixture of industrial metal, art rock, and electro, strikes as an experiment itself; however, the unique show the band never fails to deliver is another reason to see Mushroomhead live. The type of entertainment the band provides is not for the weak. 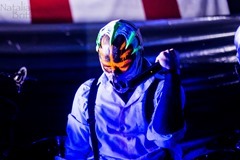 If you are hoping to timidly sway through the set, that’s not what you are going to get at the Mushroomhead concert! What you are going to get is a crowd of people insanely jumping, kicking, and yelling at the top of their lungs. 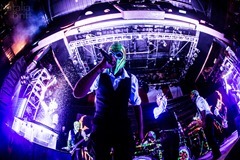 That’s the insanity Mushroomhead brought to House of Blues on Friday night along with sharp flickering lights, stage dives, and mosh pits. If you like to get wet, make sure to get there early to get a spot right next to the drum sets, which explode with water. 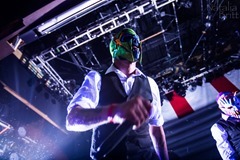 If you’re angry, excited, or even overly happy, and you surely don’t know how to let your frustration or eagerness out, do yourself a favor, and go see a Mushroomhead show. Yell, jump, scream, and kick the others in the mosh pit…. Just like the crowd at House Of Blues did this Friday. 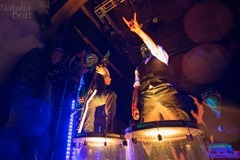 It’s guaranteed that Mushroomhead can, without a doubt, get your adrenaline pumping.